Product prices and availability are accurate as of 2019-04-16 08:52:46 EDT and are subject to change. Any price and availability information displayed on http://www.amazon.com/ at the time of purchase will apply to the purchase of this product. 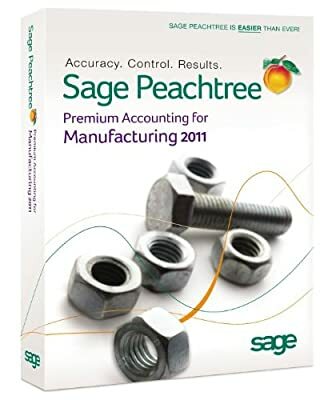 Sage Peachtree Premium Accounting for Manufacturing 2011 provides easy-to-use accounting features, manufacturing-specific features and reports, and analysis tools to help owners of small manufacturing companies improve their operations. It has a multi-user option* for improved productivity with screen-level security and a clear audit trail and more than 140 customizable reports. Manufacturing features include enhanced BOM management, the ability to automatically generate purchase orders based on minimum stock levels and re-order quantities, the ability to create/track work tickets, and serialized inventory tracking. Crystal Reports 2008 is also included, giving manufacturers even greater operational analysis. Sage Peachtree Premium Accounting for Manufacturing 2011 is the ideal choice for manufacturers.